If you're thinking of becoming an au pair and would like to be placed by ABC Au Pairs please register with an IAPA agent in your area. ABC Au Pairs have been welcoming au pairs to England for 20 years. We take care to match you to a suitable family, taking into account your independence, interests and other aspects of personality. 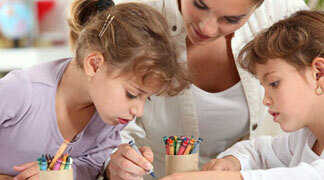 We place au pairs in England's capital, London, and in the vibrant south coast city of Brighton and Hove. Au pairs typically live as part of a family for a period of 6 weeks up to a full year to help with the family's children and household chores. You may also have the opportunity to study English. On arrival, we provide au pairs with information, guidance & support as well as contact details of other au pairs living nearby. If you would like to become an ABC Au Pair in London or Brighton you will need to register with an agent in your own country. To find an agent in your area please visit the International Au Pair Association (IAPA) website.